Fees and Rates - As far as the annual fee goes, you might get either of three versions of the card each with different annual fees. The first version has a $35 annual fee. The second version has a $59 annual fee. The third version has a $75 annual fee for the first year, then a $99 annual fee from the second year onwards. Prior to the financial crisis in 2008, consumers who have bad credit had many choices of sub prime cards. However, they all came with very high fees. The CARD Act imposed rules on the types of fees that can be charged by issuers and today, many of those cards are no longer around. The ones that survive have had to adjust their fees and be more "consumer friendly". The Milestone Mastercard is one of those cards. Who Is Milestone? Or Rather Who Is Behind It? - This card is actually serviced and marketed by Genesis FS Card Services and issued through Mid America Bank and Trust. Genesis has been around since 2001. In todays world, there are a few cards that we should be comparing this one with before coming to a conclusion. The first card that we should compare this to is the First Premier Bank Card (FP). If you get approved for a FP card, you will have to pay a $95 processing fee and also a $75 annual fee. From the second year onwards, you will have to pay a $6.25 monthly maintenance fee (which works out to $75 a year). In addition, you will also have to pay a $75 annual fee. That means that from the second year onwards, the fees will work out to $150. The second card to compare is the Verve (from Continental Finance). This card has an annual fee of $125 for the first year and $96 from the second year onwards. However, in addition to the annual fee, you also have to pay a $120 maintenance fee (billed at $10 a month). Therefore, the total fees each year will be over $200. The APR is also higher at 29.9%. Another card that is worth comparing to is Credit One. In fact, if you look at the features side by side, you will realize that they are almost identical. Like this card, Credit One has a 23.9% APR. The annual fee ranges from $35 to $99 (pretty close to this card). The advantage that Credit One has is that you can also earn reward points for gas purchases (which is very rare for a sub prime card). - Milestone only charges an annual fee. They do not charge any application fee or monthly maintenance fees that are so common with other similar cards. - Unlike other cards, there is no fee for paying your bills with any methods. So whether you use snail mail, pay online or through the phone, you will not be charged an fee. 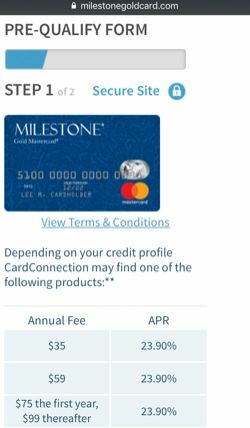 - Unlike most cards where application triggers a hard pull on your credit reports, Milestone lets you go through a pre-approval process first and it only generates a soft pull. If you are pre-approved and decide to apply, only then will you get a hard-pull. - Milestone accepts applicants who have prior BKs in their record. - Milestone does not give credit line increases. Most get a starting initial limit of $300 and have that limit for the rest of the time you have the card. - As of now, Milestone has no phone app. However, you can still manage your account online via their website. Is Milestone Credit Card A Good Card? Based on the comparisons above, we can say that the Milestone Mastercard is one of the few very reasonable cards for those who have bad credit. Unlike many other cards in the past and cards like the First Premier and the Verve, they do not charge any application fees or monthly maintenance fees. All there do is charge an annual fee and that's it. If you have bad credit and are looking for an unsecured card, this card would be a candidate, as would be Credit One. However, before we go out and apply for this card, there are a couple of things to bear in mind. Even though this card is targeted to folks with bad credit, there have been folks who have been declined. To increase your chances of approval, you should have certain pieces in place before you apply. Firstly, your credit score should preferably be above 550. It is also important to have a checking account. If you have a record and a problem with the chex system, trying getting a second chance checking account. You should ideally have settled any charge offs and collection accounts. It is also better if you already have other accounts (in good standing) in your report (like secured cards or auto loans). Lastly, if you have any federal tax liens on your credit report, it is best to settle them and get them removed. If your credit is in really bad shape, then we would suggest getting a secured card first (in fact, try getting two) and get that in your report for at least a few months. Cards like First Progress would be a good candidate. If you already have a no annual fee card like Walmart (for example), and you do not have any real baddies on your report, or if you have settle old charge offs and collections, then you might want to consider getting another no annual fee card like the Rewards MasterCard from Barclays (see what consumers say here) or the NFL card (see review here). But if you have a secured card and/or an auto loan under your belt and you have been rejected for no annual fee store cards or gas cards, then this card would be a step for those of you looking to get an unsecured card. Milestone is issued by The Bank of Missouri, a well-established FDIC-insured Missouri bank which is founded in 1891. 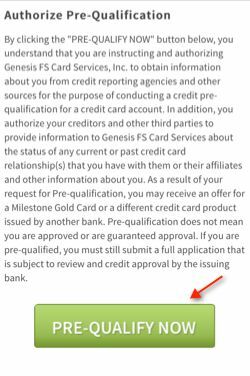 Genesis FS Card Services, Inc. is the servicer of this program. I need to speak to someone before applying, would can I contact? You can contact customer service at 1-866-453-2636 (from 6:00am to 6:00pm, Pacific Time, seven days a week). No, you have to apply online. You can click on the apply button on this page and take it from there. Can you explain why I have to get pre-approved or pre-qualify? Milestone requires that you pre-qualify first. Pre-qualification does not result in a hard credit pull. Rather there is just a soft pull. If you do not pre-qualify or get pre-approved, you will save yourself a hard pull. How long does it take to get Milestone credit card? It might take up to 14 business days after you get approved. If you do not receive your card within 21 days after being approved, please contact our Lost/Stolen Department immediately at 1-888-260-4532. They are available 24 hours, seven days a week. What is the starting limit of Milestone? According to Milestone, $300 is the minimum credit limit. Does Milestone increase credit limit? Can I transfer a balance to Milestone credit card? Can I use the Milestone Mastercard to get a cash advance? Yes, subject to credit approval, you can use the Milestone card for cash advance. You can call and request a PIN number to use your card at ATMs. Can I use the Milestone credit card abroad? Yes, you can. But you have to inform us or your card may be declined. You can call us at 1-866-453-2636 to set up a travel alert. What are the ways to pay Milestone credit card? There are a few ways to pay your Milestone bills. What information do I need to use Moneygram to pay my bills? You have to go to the nearest Moneygram location. 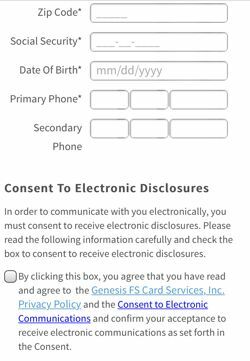 The Company name to use is Genesis FS Card Services and the Receive Code is 4911. It will post the same day as long you pay before 5pm PST. If you pay after 5pm PST, it will post the next day. Will there be a hold after I make my payment? You may experience a hold of up to 14 days if Milestone needs to verify your funds. Can I apply for Milestone Mastercard if I have been denied before? You can apply only after 60 days since your last denial. Does Milestone credit card report to credit bureaus? Yes, they report to all three major credit bureaus. 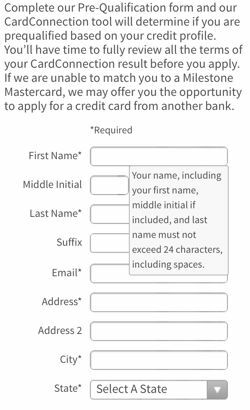 How to Apply For Milestone Credit Card? Below is a screen shot of their application page. You first go through an pre-approval process (soft pull). If you qualify, then you can go through an actual application.